Then I measured the depth of the tucks and transferred them to the pattern. You have to slash and overlap the amount of the tucks, like I did in this sba tutorial. So I made this again with my altered pattern, in a nice red double knit from Gorgeous Fabrics (it's on sale now!). The alterations on the bodice made the neckline a little higher, but I think it's a nice alternative to the original look. 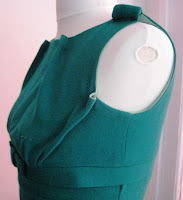 It's possible I got a little overzealous with tucking out fabric, because now the under-bust seam keeps riding up. See, this is why I should really always make a muslin after major alterations to a pattern. Live and learn, right? 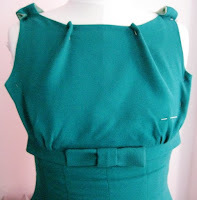 I'd never worked with double knit before, and I liked it, but I think the wool crepe is a better choice for this dress. 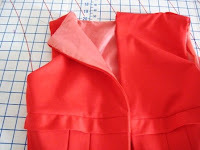 I've been getting really into Ambiance Bemberg lining (I buy mine at B&J in the Garment District, but you can buy it online here), and I used a coral color to line just the bodice in this version. I like how it creates a rich monochromatic color scheme. Whew. I think I can lay this pattern to rest now. On to the next VoNBSS project! Gertie, this dress is absolutely stunning! The fit looks perfect. You are an amazing and *busy* seamstress! Wish I could wear red that beautifully. WOW!!! That is absolutely gorgeous. I am definitely getting this pattern. That is a stunning dress - the red looks beautiful on you. I like your choice of lining fabric, the contrast in colours gives a very bespoke look. You seem to be creating dresses very quickly. Do you find it easier each time? Banging - you are so talented! Well done...this colour is amazing on you! Gorgeous dress! I just found your blog and you and I have very similar tastes in clothing styles. I understand your complaints about the dress riding up and bunching in certain areas, but keep in mind that in period, Joan Holliway would have worn a long line girdle and bra that would significantly smooth her body and provide a much firmer and base for the dress. I'm not saying that your figure is not "firm" but I think you know what I mean... A girdle from that time period was a major piece of architectural shapewear and it would have had boning and/or some thick elasticized material in it that is thicker and sturdier than what we call "shape wear" today. It would have been much stiffer and more restricting than what we're used to today. So, just keep that in mind when wearing your gorgeous form-fitting period-style dresses. Hey, maybe it would be fun to find a period girdle and wear it for a day...I think you would then understand what our grandmothers and mothers went through to be so fabulous! Man, you are productive, job hunting or not! This dress is so rad and you put that fabric into work very well, I wouldn't even have guessed it was a knit, judging from the picture. Your obsessiveness certainly paid off! This dress is so fabulous. Just found your blog and really appreciate you taking the time to keep us informed on all the little bits that go into making those classy clothes! I love the classic lines and agree Joan would too! I love this - do you think a novice could make one like this, or would it be too difficult? Sadly, my sewing experience is limited to buttons and embroidery, neither of which is very helpful, but I love this dress! Great colors! If you were to make this dress again, you should drop the waist down closer to your natural waist. That would make the bust pleats hit a better spot. Have you ever made a duct tape model of yourself? If really helps when making clothes for you specific body type! Happy Sewing!